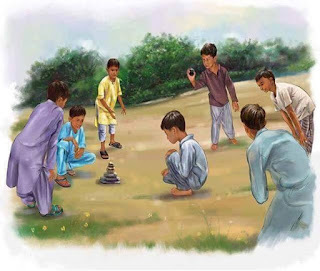 This blog is all about FREE PLAY,because now it has been proved by the reseachers that the true learning only happens when children are at their FREE-PLAY.We are here to create mass-awareness among parents, teachers and educationist about the importance of Free play so that traditional system of schooling can be changed. As I promised all my children that we are gonna wash the stuff in the PLAYGROUND, so heres the real fun started with buckets filled with bubbly soapy water and dozens of Sponges of different colours. And they started it with soaking the sponge in the soapy water as much as they could. Children just loved this activity , i dont know, it seems that it Satisfies their souls. Look at the amazing concentration of the child, children are real beings ,they know the difference between FAKE and REAL activities....we don't need to teach them,,,,more. It seems as if the children are having a fun day ,yes it was like that, but amazingly these are the real MOMENT OF LEARNING.,they learn how to soak the sponge, how much Time is needed for a particular size of sponge to absorb the maximum water, how to take the sponge back to the cleaning area in a minimum time to avoid extra spillings, how to hold the sponge so that max. utilization can be possible, and so many things in a single act of WASHING. So no experience is wasted in a life of a child. When they were cleaning the house, they didnt even missed an inch , moving all around, grabbing every part, even climbing till the top,amazing ,is'nt it? And when she climbed the top , its good to see the excitement, she shouted,"Look, I'm gonna clean all these areas".AMAZING ! I saw children starting from one play-house, they didnt go to the next one, unless they finished that one from all the sides, top , around ,everywhere, then they came to me,"MISS ERUM, we are done with this house, we are moving to the slides now", Its amazing how much systematic and orderly their Brain works as contrary to what we BELIEVE, I'm speechless....! So they kept busy for about 50 minutes ,never showed any sign of tiredness, Its we who think that children might get tired, but in realiy ,they seldom do. After we did the sponging ,we got all the buckets filled with water, each child was Carrying the bucket,and infact they felt proud that they were carrying some heavy objects (they love to carry heavy stuff, as discovered by Maria Montessori).And then we started the washing acivity to end the WASHING DAY FUN. At that time my camera's battery just finished, so I could'nt get the photos. Looks like a lot of fun! Thanks for linking to the Outdoor Play Party.